At 21 years old and with a deal to race at the Indianapolis 500 later this month, Pietro Fittipaldi crashed into an outer barrier in the days before the first World Endurance Championship race of the year on Friday. The wreck shattered the front end of his prototype, and he has “suspected fractures” to both legs. 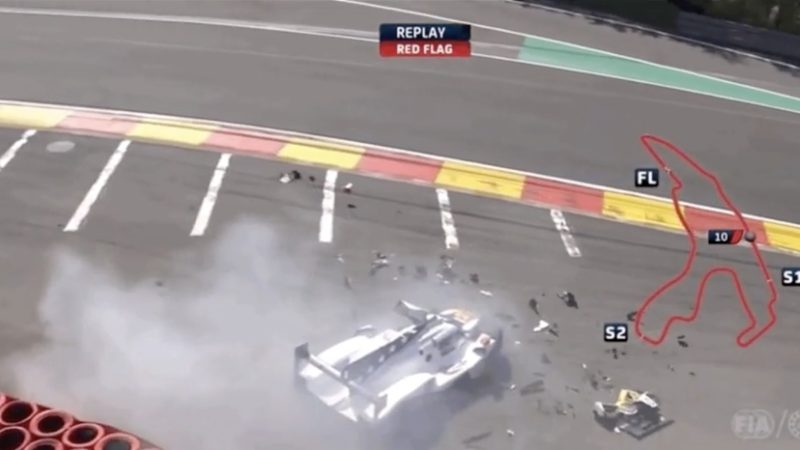 The crash happened during qualifying at Belgium’s Spa-Francorchamps circuit, while Fittipaldi was running in the top Le Mans Prototype 1 class as a stand-in driver for Renger van der Zande with the DragonSpeed race team. The race car whipped out of control going around a corner and hit an outer barrier on the track, destroying the car and causing Fittipaldi to get an airlift to the hospital. A statement from the FIA, the governing body over WEC and other racing series like Formula One, said Fittipaldi was conscious at all times after the wreck and taken to a hospital by helicopter. The statement said Fittipaldi has “suspected fractures to both legs,” but that his condition is not life threatening. The wreck resulted in a 35-minute qualifying break for cleanup, Motorsport.com reports, but Toyota’s LMP1 team won the overall pole and second starting spot once it got going again. F1 star Fernando Alonso was the Toyota that qualified second, but Alonso’s car will start first for the race—Toyota announced that a penalty will make its top car from qualifying start a lap down on pit lane. Fittipaldi had a deal with IndyCar team Dale Coyne Racing to run seven races this season as a rookie, including the Indy 500 this month. His grandfather, Emerson Fittipaldi, won the Indy 500 and the F1 World Championship twice. The race team said on Twitter Friday that it’s wishing for the best for Fittipaldi, and that it’ll keep everyone posted as more information is available. Update, May 9 at 3:40 p.m. Autosport reports that Fittipaldi has a compound fracture of the left leg and broken right ankle. He hopes to be back in a race car by late July.